Hmmm, man buns? Yes man buns. I am sure the vision of a sumptuous, scantily clad and well-oiled Hollywood heartthrob just popped into your mind – Brad Pitt maybe? How about Taylor Lautner? Oh even better, Charlie Hunnam. Sighhhhh. Well Charlie and Brad have been seen with man buns, but ladies, clean up the dirty thoughts and let your minds’ wandering eye move up a bit – to the hair. Man buns, as in men pulling back their long flowing locks into a bun or knot for red carpet events, is a trend ‘hotly’ on the rise. (Why does everything now sound like a double entendre?) 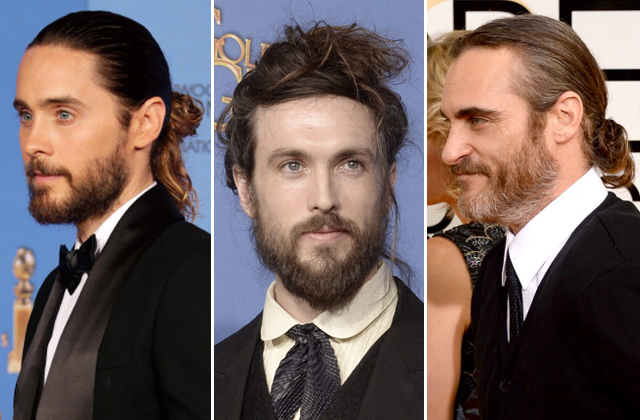 The recent Golden Globes really set the pace with no less than three stars sporting the man bun look – Jared Leto, Alex Ebert and Joaquin Phoenix. Cred to our friends at Fashionista and Refinery29 for their keen eyes in actually picking up on this – many of us were too distracted by dashing good looks or blinded by the glare of red carpet bling. I must say, man buns are working for me – especially when combined with the other masculine trend of beards and scruffy facial hair. It neatly tames an otherwise rugged ragged look. Well-done fellas! Now ladies, please put some clothes on those boys….